Why Is Matthew Kelly So Popular? 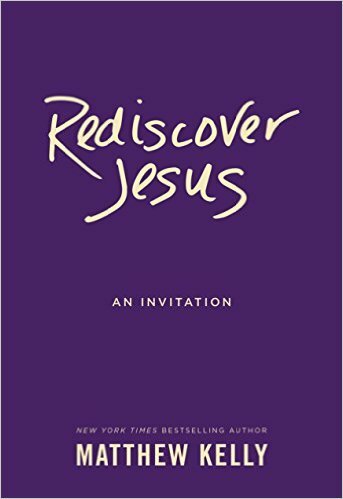 As we continue to celebrate the Christmas season, most of the Catholic blogosphere is discussing Matthew Kelly’s recent book “Rediscover Jesus.” Many parishes across the country gave this book as a gift after all of the Christmas Masses. Was this some sort of vision, perhaps prompted by the apostles’ grief over their leader’s execution? This wouldn’t explain the dramatic conversion of Saul, an opponent of Christians, or James, the once-skeptical half-brother of Jesus. The last portion of this paragraph claiming that James is the half-brother of Jesus is especially off. It implies one of two things; either Mary was not a virgin throughout the rest of her life or Joseph had other children. The issue with Mary not being a virgin is that this is a heresy as we know that Mary’s virginity was perpetual. Mary’s virginity is not even up for debate as the Church declared her perpetual virginity as Dogma. The issue with Joseph having other children is that Catholic tradition holds that he too was a virgin. Even if this tradition was incorrect and Joseph did have other children from a previous marriage, Joseph is not Jesus’ biological father, and thus any children Joseph had would, if anything, be considered stepsiblings to Jesus. This book has been released for some time now, and Matthew Kelly has not released any clarifications, so it is safe to assume that what he had printed was what he had intended. 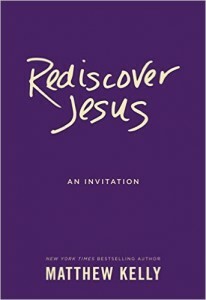 Rediscover Jesus does not have an imprimatur, unlike some of Matthew Kelly’s other works. The lack of an imprimatur is both good and bad. Good in that, at least, a bishop or cardinal did not sign off on this statement. Bad in that one could argue that Matthew Kelly has grown in such immense popularity that he does not feel the need to submit his books that claim to be in line with Catholic teaching to the proper hierarchical authorities for approval. With this slip-up, many Catholics are beginning to wonder how Matthew Kelly managed to get his books into so many parishes. Seeing as I was once a Matthew Kelly devotee, but have more or less completely abandoned him as his theology is entirely modernist, I happen to know a bit about his rise to Catholic fame. Everything I am about to say is verifiable in his talks that he had both self-published and had published through Lighthouse Catholic Media. Matthew Kelly began giving talks when he was 19 years old. He gave many talks and used some of the documents from the Second Vatican Council as the basis for these talks. When talking about the “Universal Call to Holiness” Kelly noticed that most people had checked out, so he began using his trademark “Best Version of Yourself.” People responded positively to this, so he began doing this with various Catholic principles. He began writing Catholic books, with “The Rhythm of Life” becoming a New York Times bestseller. He even had an odd book called, “Words From God” which was a book on his personal locutions in which he believed God the Father was dictating the book to him. He has since moved away from this book by order of his Bishop. More info on this book can be found on the Women of Grace blog. What launched Matthew Kelly to become a typical Catholic household name was after Rediscover Catholicism became somewhat well-known. his organization Dynamic Catholic wanted to come up with a game changer. One of his workers came up with the idea that Catholics of all kinds, practicing and non-practicing always come to Mass on Christmas and Easter. The plan was to give out a free copy of a book to each person. Kelly was reluctant at first because he wanted to give out a copy of Rediscover Catholicism to each family, but his employee convinced him to give out a copy to each family member, as one book for a family might not get read. They launched this program at a parish in Atlanta, Georgia and had tremendous success. Rediscover Catholicism even managed to bring back people who were Christmas and Easter Mass-goers to weekly Mass-goers. With this success, they came up with a plan to mass produce these books and pass the savings on to parishes. For $2 a copy you can give away these books to your church and make your fellow Catholics become Dynamic Catholics! After some time and some success giving out copies of “Rediscover Catholicism”, the Archdiocese of St. Paul and Minneapolis, with the blessing of then Archbishop John Nienstedt, partnered with Matthew Kelly and began a “Rediscover” initiative. Talks were given throughout the Archdiocese, “Rediscover Catholicism” book clubs were held in each parish, and once a year there was a “Rediscover Catholic Celebration” where speakers were invited to give lectures. This initiative only lasted for a couple of years, after the second Rediscover Catholic Celebration ended up being a massive flop with only half of the tickets were sold. “Rediscover Jesus” and “Rediscover Catholicism” are but two of many books which Matthew Kelly has to offer, which Dynamic Catholic mass produces through their private publisher. Priests at parishes can buy the copies themselves with parish funds. Or more likely, a wealthy parishioner who believes that Matthew Kelly’s approach is the best way to get people to become Catholic (I was once one of them, but not anymore) purchases the books themselves without the permission of the priest and their priest now feels obligated to pass them out after the Masses. This has been the case for some priests as witnessed by friends who work for the Church. By giving out free copies of his book and partnering with Lighthouse Catholic Media, Matthew Kelly has grown to become a Catholic powerhouse and recognized as one of the go-to speakers for Catholic teaching today. Unfortunately, those who believe Matthew Kelly is doing good will see this article as a hit piece. Yes, I am highly critical of Mr. Kelly, but as I have said before, and evidenced throughout older posts on this very blog, I once talked about how great I thought he was. The argument that Matthew Kelly is “reaching people where they are at” is not applicable here. Matthew Kelly teaches a very watered down version of Catholicism. It is so watered down that besides words that resemble those found in Catholic teaching; you would not recognize it as Catholic. Authentic Catholic thought resembles Catholicism even when Catholic jargon has been removed. Catholicism is so full of rich nourishment for the soul, that no matter how you broke it down into its simplest of forms you would still be able to reach people where they are at and challenge them. If people’s faith was a fire and Catholicism was a tree that could fuel that fire, Catholicism can be broken down into logs, branches, sticks, leaves, kindling, and twigs to feed that fire. What Matthew Kelly gives is a synthetic fire starter that has been sprayed on several leaves and nothing else. There are plenty of books that exist on Catholicism, which have been written by some of the greatest minds in Church history. The Baltimore Catechism, True Devotion to Mary, the Catechism of St. Peter Canisius are to name but a few books that will shed more light on Catholicism and Jesus then the Rediscover books can hope to shed. There are plenty of books that are written even for those who are just beginning in their Catholic faith. I encourage you to seek out some of these books and not waste your time with Rediscover; your soul will thank you for it. I was disappointed with your article to say the least, but I think it is important to clear up one factual error. This is not the case, this is part of an entire article that I quote in the book, and the source did not allow edits. The article begins on page 97. I would appreciate if you would edit your piece to reflect this. What Matthew Kelly should have done is added a footnote to this error and pointed out what the Catholic teaching is. Footnotes are commonly used when a writer wants to clarify a point and can not do so in the original quotation. UPDATE: I have received further correspondence from Matthew Kelly. The request for the Imprimatur was submitted late and has taken longer than usual, but he says the next printing will carry an Imprimatur. Creepy! And heretical! His books are a fave at the parish where we attend our TLM. A stack of those are available now; thank you for pointing out something particular for me to make people aware of. Why why why are we settling for so incredibly little. Thanks, Jeff. So few people get it because most have no idea how little we are getting, and the going is getting very lonely. Especially while in church, and while starving to death there. Hey Michele, what would you like to see handed out at Christmas/Easter instead? Sorry, I’m not sure why you ask this, or what you’re expecting. You asked why people are settling for so little, which is why I asked what you’d like to see handed out instead. If you don’t want people to starve to death, what would you feed them instead of Matthew Kelly’s books? I would have to say that the first sentence is a bit of a stretch. “Most of the Catholic blogosphere is discussing Matthew Kelly’s recent book”? Really? I think I read a lot of blogs, and this stuff is hardly a blip on the radar. I’m not trying to rip on this post; I’m simply saying that I don’t see Mr. Kelly as being so important in Catholic America, so that’s good news I suppose. That’s a fair point. I had seen a lot of comments on the Restore-DC-Catholicism blogs talking about the book and that article was being shared all around Facebook. I suppose I unfairly lumped Catholic Facebook in with the Catholic blogosphere. I haven’t read it, but what do you not like about “Forming Intentional Disciples”? Is it just those two things? The idea that authors should meet their readers where they are, as well as the idea that we should have a personal relationship with Jesus? The issue with Joseph having other children is that Catholic tradition holds that he too was a virgin. I must wholey disagree. My take always from Kelly’s book have been: read the Bible, pray, go to daily mass and go to confession — in an effort to deepen your relationship with Jesus so that you may know him personally and you may know how he wants you to live. And only then can you be the “best version of yourself”— there are no short cuts here. The sacraments are front and center. When he talks about the “Genius of Catholicism” he is most often referencing the Sacraments. I could never agree that is dumbing down Catholicism. I just finished reading “resisting Happiness” and I have to say it was one of the most inspirational and motivational books I have ever read about Catholicism. A nun who taught me in high school fifty years ago told us to always remember we were Christians first and foremost. I would recommend this book to anyone who wants to reconnect in their personal relationship with Jesus Christ. We can debate historical facts about St. Joseph but I think it’s so much more central to our lives to focus on our personal spiritual journeys and Gods direction for each of us. Matthew Kelly speaks in that topic. And your link to the Women of Grace article above seems to agree with my point entirely. That article very positive about him— unless you are just hoping the reader only reads the headline….. which a reader sent in. You make the statement above and give an analogy to it but don’t show how what he says is watered down Catholicism. I would like to hear citations of how he is doing this that back up your point. The only thing I can see from this article so far is that he should have better cited the source he quoted. Certainly. I’ve covered a lot of the issues with Matthew Kelly’s work in my article . In short, his message is reduced to catch phrases and other words used to make you feel good. “The-best-version-of-yourself” is a great example of this. You have to read that through the lens of “what he means is x.” Catholic teaching shouldn’t have to be hidden in today’s words and read through a Catholic lens. Additionally, he talks about the “genius of Catholicism,” but believes that the Mass can be whatever you want, and any problem you have with the Mass (even if there is a legitimate problem with irreverence or illicitness on the priest’s part) is a problem with you, not the Mass. He’s been doing the same schtick for 20 years now and doesn’t give any more meat. If you’ve listened to his talks and read his books, you’ll find that you can almost quote him if you see him in person. Compare to Dr. Scott Hahn who gives different lessons in each of his talks and his books and gives you a lesson on the beauty of our faith, taking the time to research a book and provide good arguments that anyone from the beginner to the seasoned veteran can use in his evangelization efforts.